The laundry room is often not just for washing clothes. They are also used for dumping dirty clothes, ironing and extra storage for non- washing items. There is a sense of satisfaction whenever we see our clothes clean after washing them, but this feeling would not last as long as you see the mix of clothes, tools and clutter on your laundry room’s floor and counters. This is just one of the reasons why you would need to keep your laundry room clean, and the things listed below are just some organization tips on how to do it. 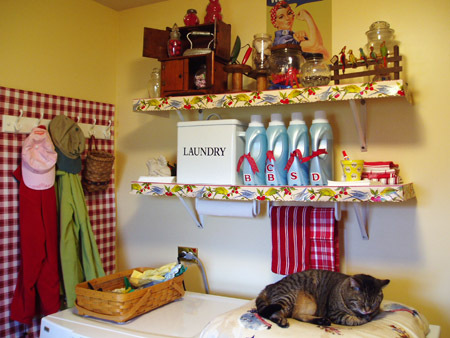 The first step in laundry room organization is fixing and making use of your space. This is especially true if you have a small laundry room. Having counters and shelves installed is a very good idea to save on space. You might also want to keep the room’s décor and overall look as simple as possible to avoid clutter. Also make sure to have enough lighting especially if you have a small space. The major problem when it comes to laundry room is the clutter. Things such as laundry detergents, hangers and clips should be hidden from sight. A great way to do this is to keep them in small jars on shelves, or you can also use small baskets for them. Just remember to keep them in cupboards, shelved or cabinets where you can easily find them. There are a lot of easy to find laundry organizers in the market, and there’s no sense not taking advantage of them. You can use baskets and boxes to store your laundry needs, while you can also use trash bins to for holding the garbage. A couple of little clear bowls arranged properly also makes a great place for holding items that you see in pockets such as lipsticks or coins. One of the main problems when it comes to laundry rooms is how much you never get enough space for everything. One great solution for this problem is to place a small counter in the middle of the room. You can easily have shelves under the counter for holding your laundry baskets, while the top can also act as a folding or sorting table. Doing the laundry involves ironing the clothes after, which is why you need to have an ironing station in the room. Make sure to have everything that you need in one space, such as the ironing board, iron and spray starch. Many stores offers ironing boards that can be placed at the back of the door for easier storage. Hi there! We help support our intensive evaluations and hundreds of hours of research through affiliate commissions on purchases made through our links. We are committed to publishing honest and unbiased guides that will ultimately help you, the buyer. We also list down our clear thought process on how we arrive to recommending a product. Questions or Errors? If you do find errors, kindly tweet us @EvrythingSimple or you can send us an email and we will fix it right away. Thank you!